More than 80 reporters and editors of the Los Angeles Times have accepted buyouts and will leave this week, according to a source close to the paper. The departures are certain to rock the newspaper already roiled by high level dismissals and conflict with the Times' parent company, Tribune Publishing (TPUB). The roll call of staffers leaving the paper will -- like cuts have at so many struggling newspapers -- leave gaps in coverage of significant beats. Nearly every department got hit with departures, including metro, national and international desks, as well as sports, obits, food, education, business beats and the editorial page. Bureaus from Seattle to London lost staff. Among those departing are Sandy Banks, a noted columnist who has spent more than three decades at the Times and is considered to be the voice of the south LA community. "For me, it's a chance to take a breather from the news business," Banks said to CNNMoney in an email. "It gives me the opportunity to survey the landscape and see what's the best way to contribute to actually solving some of the problems I've written about." Tribune Publishing announced the need for buyouts in October. The Tribune company also owns the Chicago Tribune, Baltimore Sun and some smaller publications. 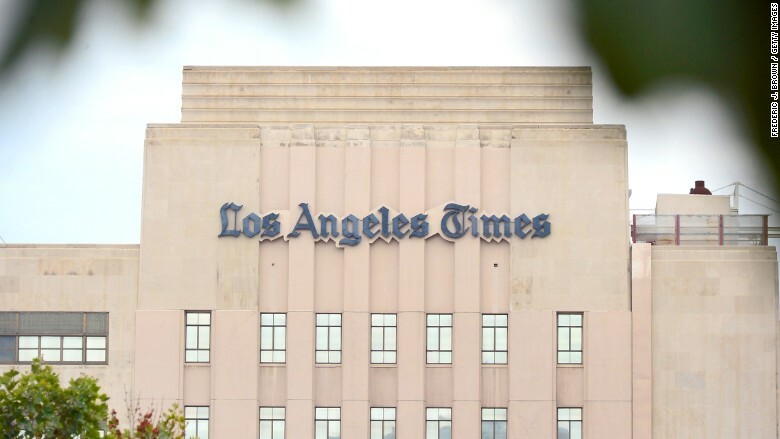 At the Los Angeles Times at least 50 buyouts were needed, but 82 people have agreed to leave the paper, according to a list provider to CNNMoney. The cuts have loomed over Times staffers since early fall and came after the paper was rocked by Tribune CEO Jack Griffin's dismissal of Times publisher Austin Beutner. Griffin installed former Baltimore Sun publisher Timothy Ryan in his place. The move was seen by many staffers as a power grab by Griffin, who feared that Beutner was asserting too much control over the paper and was quietly setting the stage for a takeover by Southern California buyers.